Gov. Bill Walker’s climate task force met for the first time Monday in downtown Anchorage. The 20-person team, formed by the governor this fall, is supposed to come up with a list of recommendations for how the state should respond to climate change. But the team is facing questions before it even begins work. During the day-long meeting, team members expressed a combination of fear and hope: fear at how fast the natural world is changing, but hope that climate change might turn out to be as much an opportunity as it is a risk. Isaac Vanderburg, who runs the Anchorage business accelerator Launch Alaska, put it most succinctly. Ralph Andersen, head of the Bristol Bay Native Association, said the issue that’s gotten his attention is erosion. Former state lawmaker and Northwest Arctic Borough Mayor Reggie Joule encouraged the group to be realistic in its recommendations. He said promises have been made to Alaska communities in the past, especially on issues like village relocation. This time, Joule said he’d like a frank discussion of what actions can really be taken and, most crucially, who will pay for them. Several team members have been here before — ten years ago, when then-Gov. Sarah Palin created a similar climate change task force. Molly McCammon, of the Alaska Ocean Observing System, was a part of that effort. She said the last decade has only made things more urgent. One big question is whether the team will be able to build support for whatever recommendations they come up with — not least from state lawmakers. The task force includes just one representative from the oil and gas industry — BP Alaska President Janet Weiss — and none from mining or timber. It does include two representatives from commercial fishing, along with current and former local and tribal officials, representatives from the University of Alaska and other research organizations, several members with experience in renewable energy and one from an environmental group. 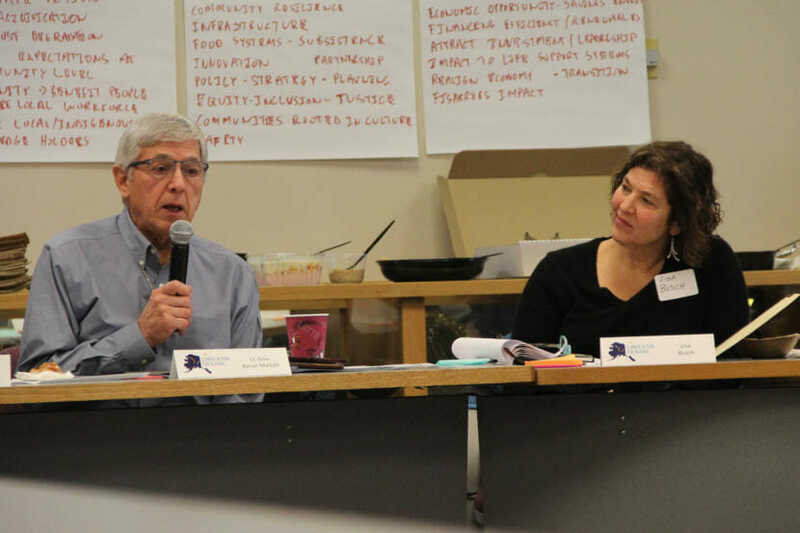 “The broadest range of voices, of Alaskans being involved and heard is, we believe, crucial to this effort,” Mallott said. Team members will split into working groups to come up with potential recommendations in four areas: reducing greenhouse gas emissions, adapting to environmental changes, research and immediate actions. The task force will meet in person just one more time before it must deliver formal proposals to the governor in September 2018.